This was originally published January 25, and updated January 27. 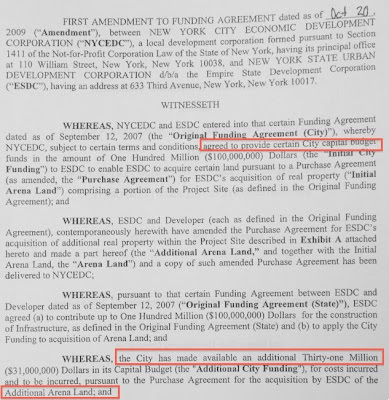 Among the voluminous documents that were part of the Atlantic Yards master closing, first made available today, is one that confirms that, despite previous reports, New York City gave Forest City Ratner $31 million for arena land purchases on top of the $100 million it originally provided. And even if that represents a reallocation of city subsidies, rather than an additional subsidy--the evidence is murky--it opens up the possibility for additional city infrastructure subsidies at some point. [Updated January 27: The Daily News reports that the funding was reallocated to provide Ratner more cash up front--and Ratner must thus pay $31 million for infrastructure later, with no additional city subsidies, according to the New York City Economic Development Corporation. City Council Member Letitia James called a Ponzi scheme. That number was first indicated in bond documents that emerged in December, which cited certain costs incurred and to be incurred in connection with acquisition of the Premises by ESDC. David Lombino, a spokesman for the New York City Economic Development Corporation, in December told me, "The $131 million referenced is part of the total original commitment (not new money) and will go to FCR for site acquisition and infrastructure work." That indicates both property acquisition and infrastructure. I erred in initially emphasizing that it was for infrastructure. But it appears Lombino misled me by stating that it would go for both land and infrastructure. An 10/20/09 amendment to the City Funding Agreement, initially signed in September 2007 states that the city has made available an additional $31 million in capital funds for land on the arena block. Does it also go to infrastructure? No, it went to purchase four properties on Dean Street now part of what is called Arena Land (see graphics below). As noted above, Lombino described the $31 million as "part of the total original commitment (not new money)." That's murky. According to a nonbinding Memorandum of Understanding (MOU) signed in 2005, regarding the initial $100 million: The City’s capital contribution shall be used for the same purposes as the ESDC’s capital contribution [site preparation and public infrastructure improvements], except that the City's capital contribution may also be used to fund a portion of the costs of acquisition of the Arena Site (other than the MTA Properties). That suggests that city funds would be used for both infrastructure and property acquisition. The word “except” allows the city to use its capital contribution for property acquisition, but the phrase "may also" suggests that the $100 million would not be used exclusively to buy property. But the MOU was not binding. Then the city added $105 million in infrastructure capital support for the project. Lombino seems to have been suggesting that the $31 million came out of the "original" total of $205 million: the combination of the initial $100 million and the $105 million added. I can't confirm that in city budget documents, though nor can I find an additional $31 million allotment. But even if the $31 million comes out of funding once designated for infrastructure, what's to stop the city from contributing more to infrastructure later--and thus upping the city subsidy for Atlantic Yards even more?